A new review of 22 major voucher studies has found that the majority of studies nationwide found positive effects on students in private school choice programs. The report, titled “The Wisconsin Role in the School Choice Movement,” was released in conjunction with the Tommy@30 event on May 23, celebrating former Governor Tommy Thompson. Of the 22 studies surveyed by researchers John F. Witte and Patrick J. Wolf, 13 showed positive educational effects for voucher students compared to control public school students. Five studies found no statistical effects, and four found negative effects. 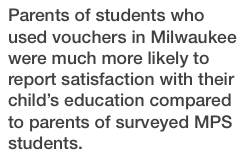 The report highlights two major studies that compare outcomes for students in the Milwaukee Parental Choice Program (MPCP). Study I was conducted from 1990 to 1995, and Study II began in 2006 and is partially still ongoing. The researchers write that the latter is considered to be superior, as it had a larger study sample, stronger statistical methods and more available resources. Neither study found statistically significant differences in test scores between traditional public and voucher students, but a look into other important outcomes such as graduation rates and attainment shows positive results for choice students. Compared to their public school counterparts, choice students graduated high school and attended four-year colleges at higher rates. The colleges that MPCP graduates attended also “appeared to be of higher status,” the according to the report. 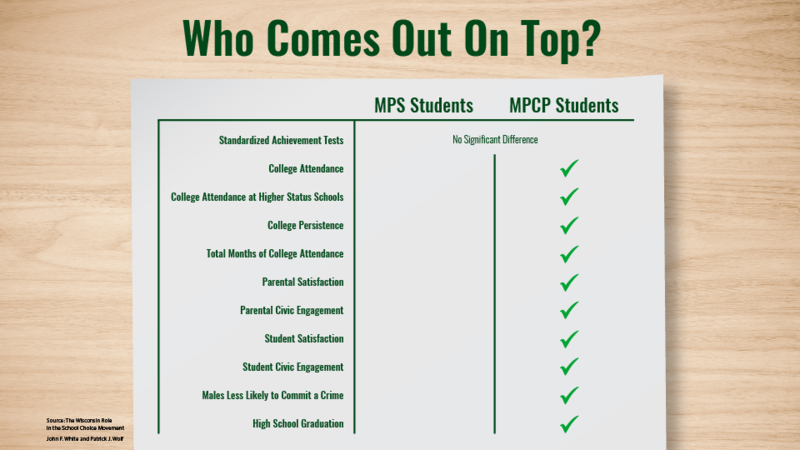 Just 21 percent of MPS students surveyed attended a four-year college, compared to 27 percent of MPCP students. That amounts to a near-30 percent increase in the likelihood of college attendance for choice students. Voucher students were also more likely to continue into their sophomore year of college, boding well for degree attainment. Behavior outcomes, often considered “soft measures” compared to hard numbers such as test results and graduation rates, show positive results in both Milwaukee-focused studies. Parent surveys revealed much stronger satisfaction with their child’s education among voucher families than those in the public school control group. Parents that sought vouchers consistently named education quality, teacher quality, and superior discipline and safety in private schools as the most important factors in their decisions. They also reported higher satisfaction on “almost all dimensions of schooling – the largest difference being in the areas of highest priority they list for why they sought vouchers – educational and teacher quality and discipline in the school” compared to public school parents surveyed. MPCP families tended to have lower incomes than MPS families, but had higher education levels and were more religious. The report delves into a brief history of MPCP’s beginnings and highlights the subsequent spread of voucher programs to other states. The overall survey of 22 different studies includes research on programs all over the country. One study, focused on D.C.’s Opportunity Scholarship Program, found remarkable results for voucher students. 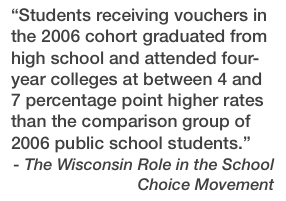 While 70 percent of public school students surveyed graduated high school in four years, 91 percent of students who used a voucher achieved the same. Other reports released in conjunction with the Tommy@30 project include research on the Wisconsin Works program as well as other economic reforms championed by former Governor Tommy Thompson.